Start Your Growth Plan Here! What's Keeping You From Growing? Whether you want to create a strategic plan to grow enrollment, academic quality, economic sustainability, faculty engagement, board leadership, and/or some other aspect of your school, our unique data-driven methodology will guide you to the path of greater success and joy. It takes courage to lead a school. You have your own strengths, your own unique genius. Now isn't the time to just copy other people. And you definitely don't want to follow the same tired management models from yesteryear. A school is a complex organization, with multiple stakeholders that have different expectations and priorities. So you also don't want to risk using business experts who don't understand the nuances of educational leadership and the complicated relationships involved. You need a plan that appreciates your specific context and plays to your strengths! We have a repository of best practices and wisdom gained from extensive experience across the full spectrum of PK-12 schools. We Guarantee to help you find a way forward using our data-driven process to discover the opportunities and barriers, and then help you create your own path to deeper relationships and sustained excellence. 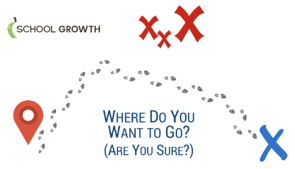 Are you ready to start your growth plan? We offer easy ways to take the first step. You might begin with a leadership retreat to assess organizational health and create a short-term tactical plan to achieve breakthrough momentum in the next few months. Or, your path to growth could start with a workshop to improve faculty engagement, servant leadership and collaborative trust. Or, to meet the requirements of accreditation and/or your board, you may need to create a strategic plan that is will produce real results. In about 30 minutes we can provide an initial assessment and provide recommendations to start your strategic growth plan. This is a simple, risk free way to tap into our expertise and learn why over 3,800 schools over the last decade have trusted us to create their unique path to success. What Does a Growth Plan Include? "This leadership retreat was awesome--and I've been to so many of them. I loved the way you challenged us to understand the importance of faculty quality and engagement, and then provided opportunities for healthy conversations to deal with issues that have plagued us for far too long." To get started on your Growth Plan, please complete the form below and a member of the School Growth team will be in touch soon.